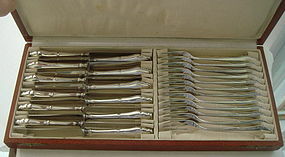 This boxed set contains 12 knives (7 in.) and 12 forks (6 in.) in a Chippendale pattern manufactured by Lutz & Weiss of Pforzheim, Germany, introduced sometime in the early 1900s. They are marked with Lutz & Weiss's mark, 800, and the Imperial half-moon and crown. These can be used for fruit, cocktails, cheese, pastry, or many other things. The fitted paper-covered box (which has damage about 2 in. x ¾ in. of damage) about has protected them from friction / stacking wear, and there are no dents, repairs, or flaws, or monograms – a great set! The forks weigh 290 g., and the usual allowance of about 15 g. for knife handles (blades are 'Rostfrei' or stainless) would add another 175 g. or so, for a total of 465 g. of 800 fine silver.